Late last week, CNEWA’s president Msgr. John E. Kozar received a note from Samir Nassar, the Maronite Archbishop of Damascus, along with a letter he’d written describing the situation his church in Syria is facing this Lent. Please remember the men, women and children of Syria in your prayers as they continue living their own long Lent. In six years of war, the face of Syria has changed quite a lot. It is a huge disaster zone of debris, carbonized buildings, burned down houses, ghost neighborhoods and towns destroyed to the ground. More than 12 million Syrians, 50 percent of the population, are lacking a roof. They form the largest mass of refugees since the Second World War. Several million have left the country in search of more merciful skies. Many are waiting for mercy in camps of misery, some of have attempting to leave and others are in line at embassies — nomads in search of a welcoming land. How can they leave this Syria of torments? The family — which fortifies church and nation and has saved the country in the past — is heavily shaken. Seldom is a complete family found. Violence has scattered this basic cell of society. Some family members are in graves, others in exile, in prison or on the battle field. This painful situation is the cause of depression and anxiety and forces those few left without support to beg. Young fiancées, separated by this exodus, the immigration of their partner or military mobilization, cannot marry. Crisis surrounds them. A hope for their future has crumbled. How is it possible to follow a course without a family or with a broken family? The children are the most fragile. They have paid a great price for this merciless violence. According to UNESCO, more than three million Syrian children haven’t attended school because they have to prioritize their physical wellbeing. Those that have been to school witness the demise of the quality of teaching due to fewer faculty and students in remaining schools. Academic failure is imposed by these overwhelming circumstances. The centers of psychological support cannot overcome the number and depth of wounds and psychic blocks. How do we restore the spirit of these children destroyed by violence and barbaric scenes? Parishes have seen the number of parishioners diminish and pastoral activities reduced considerably. The priests are deprived of the means to provide human and spiritual support. The Church of Damascus has witnessed the departure of one third of their clergy (27 priests). This is a hard blow weakening the place and role of the Christian minority already in decline. How do we fix this alarming hemorrhage? Can we imagine a Church without priests? The Syrian people are no longer looking for liberty. Their daily combat is finding bread, water, gas and fuel which are harder and harder to find. Electrical shortages have become more frequent and lengthy. These darken nights and reduce any social life. Finding a little room for shelter in a country in ruins has become an impossible dream for families and even more for young couples. In this image from last December, debris is seen amid pews after an explosion inside St. Mark’s Coptic Orthodox Cathedral in Cairo. A bomb ripped through the cathedral complex, killing at least 25 people and wounding dozens, mostly women and children. The Vatican confirmed today that Pope Francis is considering a papal visit to Egypt, but no timetable has been set. Sister Arousiag Sajonian heads the Armenian Sisters of the Immaculate Conception in Gyumri. 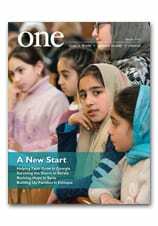 Read about her work and An Unshakable Faith in the Autumn 2016 edition of ONE. Pope Francis is shown beginning his Lenten retreat at the Pauline Fathers’ retreat center in Ariccia, 20 miles southeast of Rome. The pope completed his retreat on Friday 10 March. In a gesture of solidarity, he made a donation to the poor people of Aleppo. CNEWA donors — and newlyweds — Ralph and Dorothy met us for breakfast in Anaheim. A real highlight of traveling around the country and taking CNEWA’s message to the world is getting the chance to meet some of CNEWA’s friends and supporters. When I went to the L.A. Religious Education Congress in Anaheim a couple weeks ago with the Rev. Elias Mallon and Deacon Greg Kandra, I had just that opportunity. We got to break bread (or butter some pancakes) with a delightful pair of CNEWA donors, Ralph and Dorothy. Deacon Greg and I met them over breakfast at the Original Pancake House in Anaheim (the sourdough pancakes are amazing!). Ralph and Dorothy, pictured above, were married just 20 months ago on the 4th of July. They are as happy and energetic as any newlyweds could be. Dorothy, a native Californian is a special education teacher with a M.A. in Theology — she started her teaching career at age 53. Ralph, a retired Aerospace Engineer, was born in the Bronx but moved to California after college. Dorothy’s love for helping others was instilled by her grandmother, who would always take time to feed the hungry. Like her, Dorothy has an affinity to care for the less fortunate, and especially loves to help children and mothers in need. She joked that she has worn Ralph down to see things her way and together they have shared their love with suffering families in Iraq and Syria. For that kind of heartfelt generosity, CNEWA remains profoundly grateful. Equally as heartwarming were their stories about their longtime friendship, recent marriage and their two beautiful families — 10 children in all, with a bevy of grandchildren and great grandchildren. It was the perfect culmination to a weekend filled with energy, spirituality and friendship at the L.A. Religious Education Congress. CNEWA was invited to participate in the L.A. Religious Ed Congress for the first time this year. The theme of the congress was “Embrace Trust,” befitting for CNEWA, because embracing trust is the essence of our work. Each day we place our trust in the Lord to guide us on our mission — protecting our partners and the people we serve in the most troubled countries in the world. We excitedly accepted this invitation to share a celebration of God’s love and the lessons of the Catholic Church. The Congress promised a weekend of new and renewed friendships and it did not disappoint. With an estimated 40,000 attendees, there was constant activity in the Exhibit Hall, where we enjoyed greeting participants and sharing our mission of mercy and hope with our friends on the West Coast. Youth groups, clergy, religious educators and laypersons all united by faith and kindness of heart. Debora Stonitsch introduced attendees to the work CNEWA is doing around the world. One would think manning a booth for eight hours a day for three days would be tiresome. But with so much energy and personal encounters, Deacon Greg, Father Elias and I found it anything but. The time passed quickly as we connected with old CNEWA friends — like the Rev. Brian Escobedo representing the Byzantine Catholic Eparchy of Pheonix. Father Brian had graciously hosted us at his parish in San Diego last October to speak on the crisis in the Middle East. The Rev. James Babcock, representing the Melkite Catholic Eparchy of Newton, joined us at our booth, speaking with visitors about the Eastern Catholic Churches — he even took the survey we were conducting. We were happy to meet up with an old friend, the Rev. Brian Escobedo from San Diego. It was an exciting and rewarding weekend, making new friends and re-connecting with old ones, and we hope to visit Anaheim again next year. Meantime, if you would like more information about the Catholic Near East Welfare Association, or would like CNEWA to visit your group or parish to share our story, please contact our Development Director, Norma Intriago at nintriago@cnewa.org or me, Debora Stonitsch, Engagement and Partner Outreach at dstonitsch@cnewa.org. A displaced Iraqi woman prays the rosary in 2014 inside St. Joseph Church in Erbil, Iraq. The church gives refuge to thousands of people who were displaced by ISIS. Given the ongoing crises in the Middle East, North American, European and other Western nations will need to be more generous in coming to the aid of refugees and displaced peoples, said two prominent church leaders. The answer is continued assistance, “not to close the gates of the countries where people are knocking for survival,” said Archbishop Silvano M. Tomasi, former Vatican representative to U.N. agencies in Geneva. The archbishop and cardinal spoke about a 10-day visit to Iraq, Jordan, Lebanon and Greece to visit refugees and church-based organizations offering aid and assistance. The 9 March media event was hosted by the Migrants and Refugees Section of the Dicastery for Promoting Integral Human Development. Both Archbishop Tomasi and Cardinal Mahony noted how the current populist sentiments in parts of Europe and the United States were negatively affecting the health, lives and dignity of millions of people needing accommodation and assistance. “I can understand that with the political development of populist movements and xenophobic groups that politicians are concerned about limiting the massive arrival of people in the (European) Union,” Archbishop Tomasi said. However, he added, the consequence is people are trapped where they are, “they cannot go back and they cannot go forward,” and families often are broken up because they find themselves stuck in different countries. A country’s right to regulate how many people come to them for resettlement needs to be respected, he said, but human rights and legal commitments to international conventions must also be respected, he said. “This generalization of people who are different as a threat just compounds the issue and the problem,” he said. The best way to handle resettlement, he added, is for the incoming family to have local families and communities, like a parish, reach out and help integrate them into the local culture. While the world struggles to find a solution to the refugee crisis, “we need to support the programs that are making their lives less miserable,” such as those run by Catholic Relief Services and Jesuit Refugee Service, Archbishop Tomasi said. “Compassion fatigue should have no room at this moment,” as millions of people are still in need, he said.